Rabbi Benjamin Sharff became the Reform Temple of Rockland’s spiritual leader on July 1, 2016. Rabbi Sharff came to the Reform Temple of Rockland from Har Sinai Congregation in Owings Mills, Md where he served as their senior rabbi since 2010. He previously served as rabbi at Temple Emanu-El in Tucson, Ariz. Rabbi Sharff has a lifetime background in the Rabbinate. The son of a Reform Rabbi, he lived in Virginia Beach, VA and Baton Rouge, LA before the family settled in Houston, Texas, where he grew up. 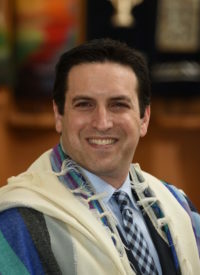 A graduate of the University of Texas at Austin with a Bachelor of Arts degree in psychology, Rabbi Sharff received his Rabbinic Ordination and a Master of Arts in Hebrew Letters from the Hebrew Union College-Jewish Institute of Religion in Cincinnati in 2004. While at Har Sinai Congregation, Rabbi Sharff brought a sense of energy and excitement to HSC’s Congregational life. This included the introduction of Shabbat Rocks!, a Shabbat service which was aided by Chai Jinx, HSC’s own in-house rock band. Rabbi Sharff is committed to bringing the same level of innovation to the Reform Temple of Rockland community. Rabbi Sharff coordinates and teaches adult and youth education programs and communal outreach programs; engaged in interfaith activities and discussions; and participates in the greater Rockland area. Rabbi Sharff is a board member of the Rockland Jewish Federation and Foundation. He also serves on the Executive Committee of the Rockland County Board of Rabbis and is a member of NJWHVARR (New Jersey – West Hudson Valley Association of Reform Rabbis). Rabbi Sharff is also involved with iCan (interfaith clergy association of Nyack) and RCSJ (Rockland Clergy for Social Justice). Rabbi Sharff is a strong advocate for Israel. He has led a congregational trip to Israel and is involved with Association of Reform Zionists of America (ARZA), AIPAC and, most recently, the Rabbinic Cabinet. Additionally, Rabbi Sharff conducts both traditional and creative worship services and ministers to the Congregants’ spiritual, personal and religious needs. Rabbi Sharff has a particular passion for taking on topical issues and issues of conscience. Rabbi Sharff is married to Dr. Joy Sharff. The couple has three children, Emily, Noah and Alex. Both Rabbi Sharff and his wife are accomplished musicians; he plays rhythm guitar, and she plays the clarinet. You can reach Rabbi Sharff at (845) 358-2248 x105 or via email at RabbiSharff@RTRNY.org. Cantor Sally Neff has a gift that enables her to touch the hearts and souls of those around her. She is warm and welcoming, and the look on her face when she is singing reflects her deep love of music and worship. A master educator in the classroom and in less formal settings, Cantor Neff loves working with both children and adults. Her sermons in song – a combination of performance and teaching – reflect a depth of knowledge and talent that is glorious to behold. Cantor Neff has had the honor of singing under the direction of Ben Steinberg, the renowned composer of Jewish music, and alongside the well-known Jewish tenor, Alberto Mizrahi. Born and raised in Queens, New York where she attended Temple Israel of Jamaica, she began singing at services when needed. She completed a double degree program through Oberlin Conservatory of Music and Oberlin College, where she studied Vocal Performance and Judaic Studies, earning honors in both. Her great love for Judaism, spirituality, and music led her to pursue cantorial school rather than a career on the stage. 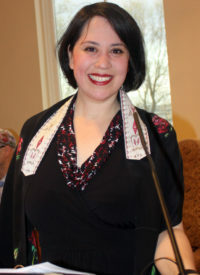 She attended the HUC – JIR School of Sacred Music, completing her degree in 2002 with a thesis entitled, “Music as Midrash: Music as a Language for the Creation and Communication of Meaning.” Before coming to The Reform Temple of Rockland, she served congregations in Edison, New Jersey and Worcester, Massachusetts. You can reach Cantor Neff at (845) 358-2248 x106 or via email at CantorNeff@RTRNY.org.